Phew! It seemed to take forever to break 400, but it feels like I’m now officially Over The Hump. Today I moved Bonbon into its new home–an 18-gallon storage tote! I can’t say I’ve ever had a project that required its own large tote before. Also, it looks pathetically small right now, but I know it’s going to grow like a weed once I start piecing everything together. For those of you who are just now joining me on this journey, my hexabon goal is 685 (I call them hexabons because they’re like bonbons–I can’t make just one!). 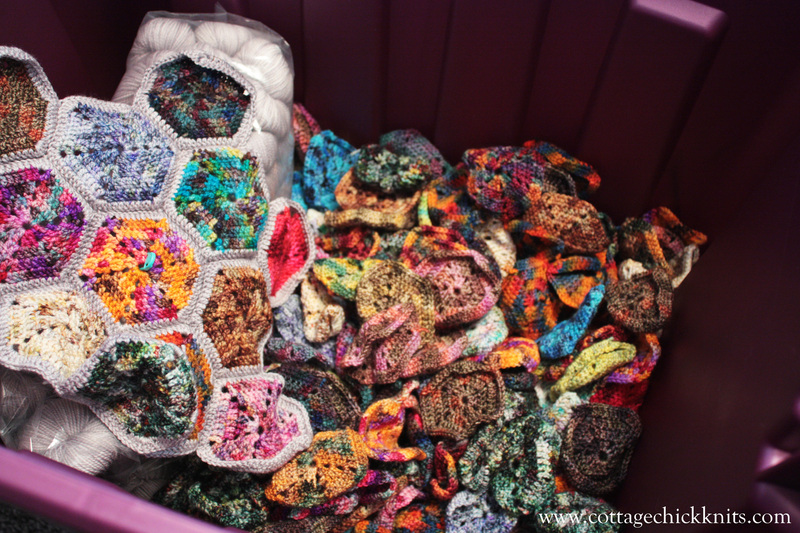 I’m making this blanket as a bed topper, and I’m using Koigu exclusively–KPPPM for the hexabons, and KPM for the borders. Now, 685 might seem like an insane number, but in many ways, this has been the perfect project. Each hexabon takes less than 15 minutes to make; I’m using a bunch of different colors, which means I can invest incrementally instead of initially; and the pattern is both easy to memorize and interesting to work. I’ve also found that it’s a great car project, and it pairs well with audio-books and podcasts. So, that’s it for now, folks! Stay tuned, and happy stitching! I’m off to make some hexabons…. The count just keeps getting higher and higher!